Looking for a good quality dual jogging stroller for your infant twins? If yes, you are at the right place. The market is flooded with so many double jogging strollers from hundreds of brands, but it’s difficult to choose the best one. To make it easier for you, we’ve hand-picked 7 top-rated double jogging strollers after doing proper research and considering everything that make a double jogging stroller the best. We are going to review them in this article to assist you make the right decision while staying on budget. Because of wrong decision many parents had to seek the service of a nanny or a babysitter. Read to end if you wouldn’t like to one of them! Baby strollers are awesome for any parent who wants to spare some extra time to spend with their little ones. It will also save you from spending so much money on the nanny services as you can easily tuck up your kid along shopping sprees, running routines, and quick visits to relatives. Before we give you a list of top-rated dual jogging strollers, let’s discuss what you should know about a baby stroller first. As I said earlier, to make the selection easier for you, we’ve picked 7 top-rated double jogging strollers after doing proper research and considering everything that we discussed above. Here’s the collection. Let’s have a look. You surely enjoy the time you spend with your children, but we can understand how troublesome it is to move with two kids at the same time. You can get BOB 2016 Revolution FLEX DuallieStroller, a wonderful stroller suitable for all-terrain runs, to make everything easier. This stroller makes your daily life easier with its fabulous features like an enhanced quick release design for both front and rear wheels, adjustable handlebar, one-hand reclining seat adjustment, adjustable suspension, extra-large storage basket, an adapter for the BOB car seat and easy-to-recline seats. The stroller is surprisingly easy to maneuver. The pneumatic tires on high-impact polymer wheels are super for on or off-road adventures. The swivel front wheel allows you to lock it down for extra stability on rough terrain or while jogging. You can run wherever you like as the large wheels allow you easy movement on grass and gravel. The mesh storage basket provides 15% more storage space. You can easily take the essentials that you need when you’re running with two children. The inside pockets can store snacks, toys and more. The stroller features a multi-adjustable padded handlebar. You can adjust the handlebar with nine different positions to create a comfortable fit according to your heights. Extra-large canopies give your precious ones UV protection. Each canopy is individually adjustable and extendable. The large viewing windows help you to keep a watchful eye on both the children. Some users are not satisfied with its size. It may be a little difficult to fit the stroller into smaller vehicles. But in a large truck, it fits nicely. You can easily remove the wheels to solve this problem. Some users say the stroller is somewhat heavy. But for any well-equipped double stroller, this is pretty much obvious. Despite its size and weight, the stroller moves very smoothly. This is a well-built and very practical stroller. Overall, this is the #1 all-terrain jogging stroller in the market. We just talked about BOB Revolution Flex Duallie Jogging Stroller that measured (58.3×30.6×40) inches. But Flex Duallie Stroller is a little smaller, it measures (48 x 30.5 x 43) inches. However, it can hold up to 100 pounds of weight! It comes with a 9 positions adjustable padded handlebar, a lockable front swiveling wheel, easy two-step folding system, a lightweight frame, adjustable suspension system, a five-point padded harness, and an ultra-padded recline seat. It also has a great canopy, fantastic storage section, and an efficient braking system. 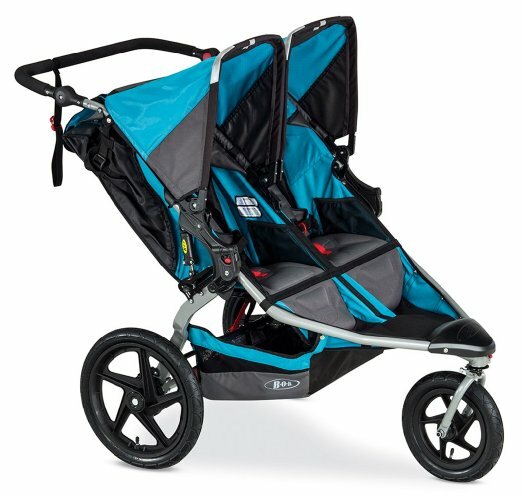 The BOB Revolution Flex Duallie Stroller is a great bargain for such a sturdy double jogging/running stroller. It has a great accessory adapter that allows it to work well with most of the infant car seats. Its nine adjustable padded handlebar positions allow any user to have a comfortable push around town, shopping, or evening walks. Lockable swiveling front wheels also give the stroller great maneuverability. The suspension leaves it with a bumpy-less-ride, and the ultra-padded seats provide your little riders with a comfortable sitting space. The five-point harness secures them on the seat while the canopy protects them from harmful weather elements. And like many user reviews state, the stroller is sleek with fantastic pneumatic wheels which give it a smooth ride too. Some users say the size is bulky if not aligned properly while the canopy storage is also tough. Well, we think if you need a great stroller, this is nothing to worry about. We think the stroller is a great one for on-the-go parents who want to spend time with all their kids no matter where they are. It has a sturdy design that makes it easy to push around. When it gets down to the Baby Trend Expedition nothing can stop you from enjoying the stroller world. 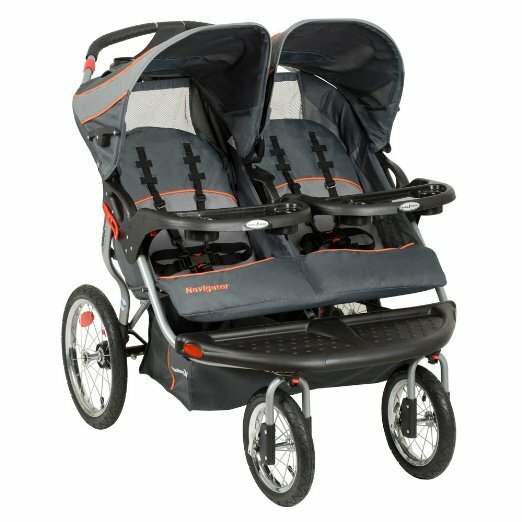 The Baby Trend Expedition Double Jogger weighs exactly 25 pounds and has a maximum weight recommendation of 5 to 50 pounds each seat. This double stroller is suitable for those parent’s, who love a lightweight dual jogging stroller because it’s perfect for lightweight use. 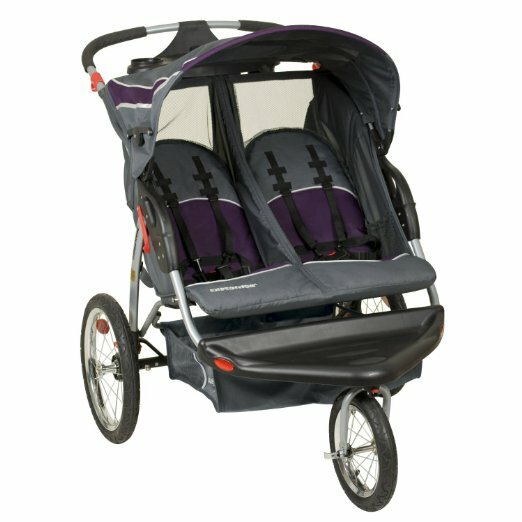 A flawless fusion of metallic frame, safety plastic caps and 100% polyester stroller materials. It has a lockable front swiveling wheel, pneumatic tires, a ratcheting stroller canopy, an easy to use parent tray with 2 cup holders, ideal braking system and a five-point harness for each of its seats. But the one feature that makes this tandem jogging stroller to rock is the mp3 speaker plug-ins that come together with its parent tray. Finally, there is a large storage basket under the seats. The maximum weight recommendation for this stroller is ideal. Its metallic frame and 100% polyester material give it a fantastic edge in durability. The lockable swiveling front wheel is the apex of maneuverability and style as it comes with the “spooky” touch. Its five-point harness secures the baby safely on their seats, while the canopy protects the baby from the sun, rain, snow and wind. The reclined seats work well with the pneumatic tires to provide a cool bumpy-less ride. The storage basket is large enough to carry your shopping and baby-parent accessories. Above all that the mp3 speakers are quite compatible with most mp3 players making it a fun-filled ride all the way through. This stroller is great. But for less maximum weigh recommendation, it may not be the best option for you if your kids are “roly-poly”. In that case, go for BOB REVOLUTION FLEX DUALLIE STROLLER as it can hold up to 100 pounds. For someone who doesn’t like to move around a lot with their babies, this stroller is a perfect choice as it is ideal for short time strolls. The stylish Baby Jogger City Select with Second Seat Stroller doesn’t come cheap. But trust me, it is worth every penny. Some of its best features are: 100% polyester easy to wash stroller material, an efficient easy to reach bicycle styled brakes, a telescoping handlebar, a UV protector, adjustable canopy, lockable swiveling front wheels, 4 polymer wheels, five-point harness and a quick fold system. It also has ultra-padded seats with multiple recline positions. Front wheel suspension and an extra-large under-seat storage compartment. But most of all, the stroller features a second stroller seat that reclines with the push of a button and comes with a second set of brackets. From my research, I would say the advantage this stroller has over many others is it allows an awesome use of stroller accessories. It offers over 16 different combinations of bassinets and infant seats to match versatile needs. The padded seats add up to its style as they recline to face each other and leave the kids with a great bonding time. The suspension system works together with the UV protector and the large canopy to provide the kids with a smooth and safe ride. The brakes are instant to help you avoid any fatality while the five-point harness safely secures the baby on their seats. The polymer wheels are strong while the 12” rear tires are pneumatic and easy to maintain. Finally, the telescoping handle can be easily set to fit your height and give you easy push. Read more about the Baby Jogger City Select with Second Seat Stroller here. One thing is clear that this perfect jogging stroller doesn’t lock automatically when you fold it like its sister strollers would. A very versatile stroller that would work great for anyone who wants to experience how different baby seat bassinets work on a maximum weight of 45 pounds stroller seat. Baby Trend Navigator Double Jogger Stroller is one of the good quality lightweight jogging strollers in the market. It weighs only 25 pounds and comes in the following 49 x 21.5 x 43 inches dimension. It has a maximum weight capacity of 100 pounds. The stroller has many key features that users would love including these major ones – it fits well with two Baby-Trend infant car seats, has a pair of lockable front swivel wheels and pneumatic bicycle tires. From the features, this stroller proves to be really awesome. It is quite affordable. It fits well with a number of infant car seats and supports two at the same time. The pair of lockable front swivel wheels provide easy movement when jogging. The pneumatic wheels are easy to maintain. And the parent-baby tray allows both parent and kids to enjoy a bite along their runs. The storage compartment under the seat effectively makes it easy to carry shopping, diaper bags, totes, and other baby-parent accessories along the stroll. In addition to that, the padded multi-position recline seats, five-point harness, canopies, and tires work together to leave your little passengers with a safe, smooth and enjoyable ride as the speakers rock them away with sweet soothing music. Check out the full reviews of Baby Trend Navigator Jogging Stroller here. When fully packed, the stroller becomes slightly unsteady as many users concur. Therefore, it might not be so ideal for fast and rough runs. This cheap baby stroller doesn’t seem like a bad bargain for anyone who uses smooth alleys and prefers a great evening walk. If you are a serious runner and looking for an all-around lightweight sports stroller that is great for not only jogging but also for everyday use, Thule Urban Glide – dual Jogging Stroller is the perfect double running stroller for you. This stroller is super for its run-ability, high quality and unbeatable maneuverability. Featuring a Swivel front wheel, this stroller is easy to maneuver in any urban terrain. The front wheel locks into place to stop the stroller when needed. Its lightweight design makes it easy to push and transport. The stroller allows you to fold it with one hand while holding your child. The folded stroller is compact to fit in any vehicle. The stroller features a large storage bin under the seats. The bin is water-resistant and zippered that keeps your belongings safe. This stroller is designed not only with the child’s comfort but also with safety in mind. A full rear-suspension system provides a smooth ride for your little passenger. The 5-point harness system ensures safety while rolling. A nicely padded vented top seat reclines to flat enough for napping. Multi-position canopy blocks the sun at any angle and a peek-a-boo window allows you to see your little one quietly. The folded stroller does not self-stand. 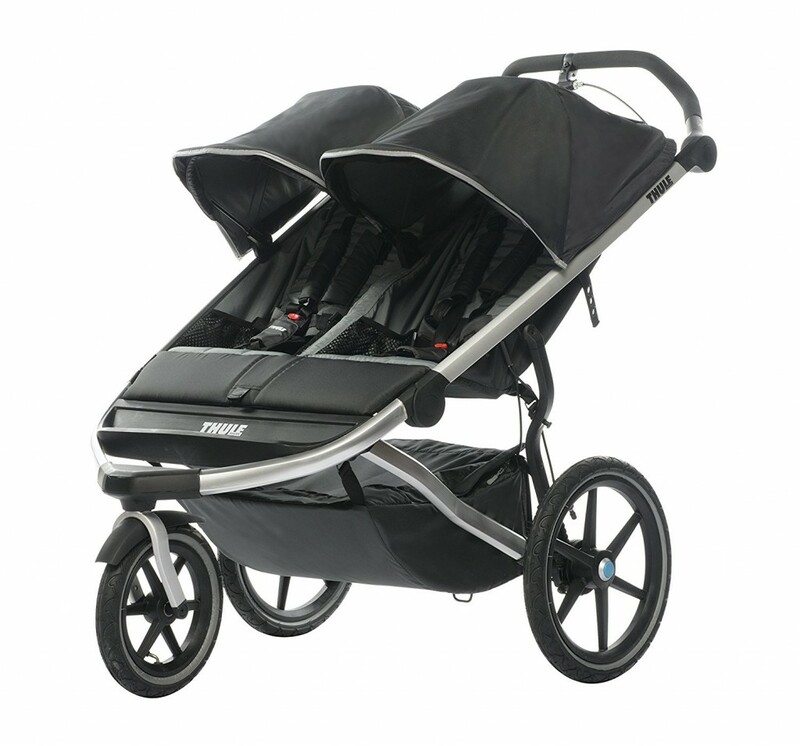 The Thule Urban Glide – Jogging Stroller is a high-quality stroller and a good choice for jogging or everyday use. This is the product that most of the users recommend buying without hesitation. 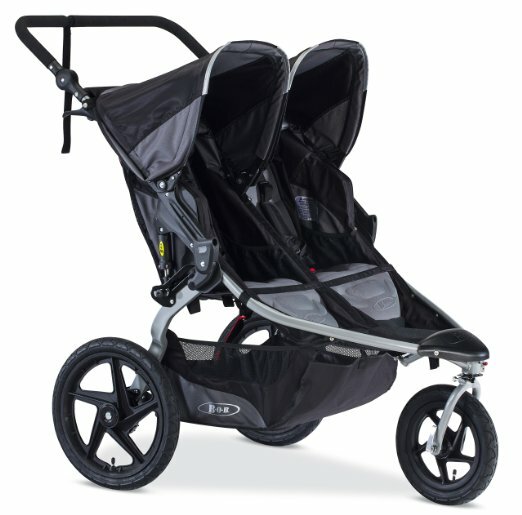 Read full reviews about Thule Urban Glide – Jogging Stroller. Baby Jogger City Select Double Stroller with Second Seat is designed to meet all the needs of a growing family. This is now the most versatile tandem stroller available on the market that features everything you need for a double stroller. This stroller will go for years as your child grows. Whether you need a travel system, a single, a double or a triple stroller, City Select Stroller is always with you. Featuring 16 different combinations, the stroller allows parents to match the bassinets, seats and car seats to meet their family needs. The City Select is a fully customizable stroller system. You can use it as a single stroller. The stroller comes with a second seat. It gives you a great way to convert it to a double stroller whenever you need. This double stroller features the same width as a single stroller. You can easily maneuver this stroller even in crowded or narrow spaces without any difficulty. The adjustable handlebar allows parents to customize the handlebar position according to their height. The seat reclines into four multi-positions to make sure your child is feeling comfortable in it. Adjustable UV 50+ sun canopy with peek-a-boo window. A 5-point harness featuring a buckle cover and shoulder pads. This stroller is not recommended for jogging. This is obviously a great stroller if you’re planning on having more than one child! How long do you need to use your baby stroller? Is this the first stroller you are going to buy for your baby? When you ask those questions to yourself, you will easily get the answer whether an expensive stroller is really worth your money or not. Depending on the features and materials there is a large variety of price range in the market. Some are more than $500 which is only recommended for senior runners, whereas a newly born baby jogging stroller is less than $200. If you consider the duration you need to run, you need to consider the high-quality materials and long-life warranty. Having an expensive twin jogging stroller has other benefits too. If you can keep it clean and work well, you can resell them on craigslist with a good price. However, before you make the decision to buy an expensive double stroller, check and sum up your needs, budget and duration of use several times. Why Do You Need A Dual Jogging Stroller? There might be many reasons why you need a double jogging stroller. You don’t need that kind of stroller only when you have twin or when you need to carry your older kid and newborn together, but also having a dual jogging stroller can give you a good controlling power and high comfort for your baby. It helps you not to leave your baby to someone when you go jogging. And because it comes with three wheels, you can run with it effortlessly. It doesn’t only give a great gripping option, but it also gives you high stability. However, the regular baby stroller is not able to give you the same experience as their running durability is far less than a three-wheel jogging stroller. It is not recommended by the pediatrician that you run with your baby if his/her age is not above 8 months. And it is also recommended that the stroller should have enough head support. If you run with a normal stroller there will be serious chance of injury to your baby as it will shake while you run. Please never try it. Having double jogging or running stroller will not make you restrain from running when it is an ideal weather outside. Instead, it allows you to get out for a run and enjoy the weather and do some exercise to reduce some weight that you got after the delivery. Every top-quality stroller should ensure the safety of your kid. It should have a 5 or 3-point harness that secures your baby on the seat. It should have an efficient braking system that allows you to safely stop the stroller anywhere you would like to. It should have a canopy, UV protector, and possibly a rain cover that keeps your kids safe during all the seasons as they ride in their dual jogging stroller. Remember as a parent you just need to consider your baby safety and comfort before making your budget for good jogging stroller. The price of a top-quality stroller should also be bearable for any buyer. If you plan to buy a top-quality stroller for your kid, getting one that favors your budget will be an ideal choice. Often you may find an inexpensive stroller that meets all your needs, and also leaves a couple of bucks for other stroller accessories, shipping fee, and groceries. What makes a fantastic stroller? The design does! How your stroller looks, what materials it is made of, what shape it takes, and how easy it is to operate— these are what sum up the design. If you are looking for a lightweight stroller, an aluminum frame would do the job. Or if you prefer a quick fold system, you could go for any type of umbrella strollers. Just remember the design also speaks of your style and elegance. A great stroller should also be very comfortable to use for you and your little one. A comfy one should have fixed or adjustable reclined seat, padded seat, a head pad, functional suspensions, a padded handlebar, and an easy to reach parent tray. It should also be spacious, have an awesome weight capacity, includes a great window of view, and feels easy on the hands when jogging. Durability is also a key factor to consider when buying a stroller. Typically, any stroller that can out leave its lifespan, give back the value for your money, and is forged from durable materials such as steel or aluminum alloy frames, durable fabric, pneumatic tires, and polymer wheels could easily be durable. So, please check the product details before you make the purchase. How does a great stroller prove its efficiency? Well, it must be easy to use, for instance, it should have a quick fold system, easy to clean fabric, compatible with bassinets and infant seats, easy to repair parts including wheels and canopies, and an easy to understand manual among others. For any great stroller, efficiency will never be written off easily. And how much can you spend extra on that budget? What is the range of stroller weight that you are looking for? How much convenient is your stroller? Like I mentioned before a great stroller comes with a great design. If the design is fantastic, the stroller could easily take the prize home. But what should you look for in a great stroller design? Here are the top five factors that you should keep in mind. If the reclining seat comes with multi-lock positions, adjustable levels or a specific degree of a twist, that’s what makes a great stroller seat for your baby. It will easily leave the baby with a great view and a fantastic resting position. You can also find out if the stroller is a single or a perfect twin jogging stroller. Another factor that determines a great design is the tires. For a great stroller the tires should be easy to replace when worn out, repair when punctured and should be made of perfect materials. Some ideal stroller tires are often pneumatic with tubes and polymer wheels. Let’s just say that if your stroller works well with other stroller accessories including hooks, cup holders, diaper bags, parent-child trays, stroller carrier and wheels caps among the rest, then it can be easily said to have the best design. I often see parents looking for durable strollers without knowing what exactly to look for. In a good stroller design, the durability will be determined by two factors: the material used and sturdy outlook. Finally, if the stroller folds easily, we would say such an advantage determines a fantastic design. Filing easily means it has a quick fold trigger, compact fold system or is easy to collapse and carry along. It also adds to the quick fix factors many parents look for. Like the sturdy high-quality BOB Stroller reviews would show, a quick fold really matters. Today life with my little gal is nothing but a breathtaking roller coaster thanks to my top-rated baby stroller. You can also enjoy the same lifestyle if you save that nanny fee and buy your little ones a great stroller. If you consider the duration of your jogging time, you need to consider the high-quality materials and longer warranty. You just need to increase your budget a little bit from usual range to brand value. Extra Tips: If you live in place where mosquitos are more than normal, you can use mosquito repellent for baby with the stroller to save the baby from whine of a mosquitos and their itchy bites. If you are new stroller user, you may have a few concerns that you want to be addressed before you buy. Here are some of the most common ones. What Makes Up the Best Stroller? Lockable front swiveling wheel, pneumatic tires, a ratcheting stroller canopy, an easy to use parent tray holders, and ideal braking system, a five-point harness, strong frame made from metallic alloy, and an easy to clean material are some of the best factors that will make up a great stroller. Some strollers will come with an option for two kids. However, the rare option in some of these double strollers provides the elder kid with an option to stand and view outside rather than remain seated all the time. A stroller that has this fantastic outdoor experience is a tandem. The Baby Trend Expedition Double Jogger is a good example. What is the Maximum Weight Recommendation for a Stroller? Maximum weight recommendation will vary for every stroller depending on design. Nonetheless, most single strollers will hold up to 45 pounds while the double jogging strollers will hold a maximum weight capacity of up to 90+ usually 45 pounds for every seat. When Should You Put Your Baby On A Stroller? Pediatricians recommend that kids should be put on strollers after they knock six months. At this age, the neck would have developed well to withstand the long rides in a stroller. Before six months is not advisable in any situation. How Will You Know If You Have The Best Baby Stroller? Strollers are tested before they are released to the market for sale. A stroller is usually marked upon testing using a “Mark of Quality.” Therefore, any stroller without this mark of quality shouldn’t be bought. What are Some Of The Best Stroller Accessories? Stroller accessories include hooks, cup holders, diaper bags, parent-child trays, stroller carrier and wheels caps among others. 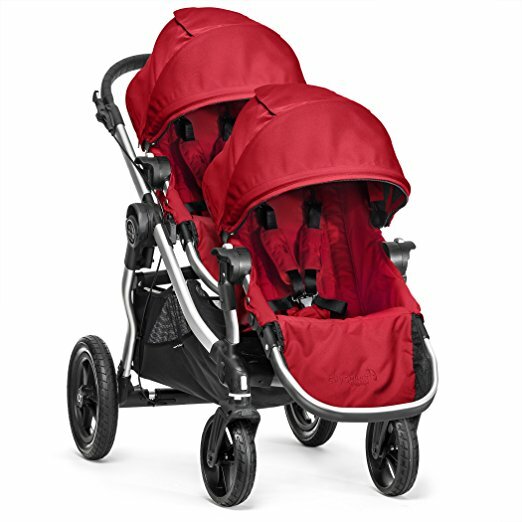 When it comes to choosing the best double jogging strollers, you must choose what will be perfect for your babies. Before you buy it, give it a try to know if it will be perfect for your twins or not. Also, you can take opinions from other parents who are using twin jogging stroller as having all information in the collection will help you to find quality and a top dual jogging stroller for your twins. But if you would like to get rid of all those trouble, just go ahead and choose one of the strollers we reviewed above or follow the guideline we provided to select the best double jogging stroller for your little ones.